I arrived into Stockholm at 9:15 pm on Thursday, September 28. One of our Tango Diva members Liza offered to show me around while in Stockholm. So, I expected that we would get together some time during my trip, but I never expected her to be waiting for me in the lobby of the Diplomat Hotel! What a treat! I walk to the counter to check in, all the while thinking I would be in bed by midnight. But moments after getting my key, I see a gorgeous blonde stand up and calls out “Teresa!” Sure enough, it was the darling Liza. She handed me a beautiful black bvlgari bag and says, “I just came from a cocktail party at Bvlgari, and I thought you would like a gift bag too.” Of course, I want a gift bag from Bvlgari! She then tells me that Thursday night is a big night on the town and that she wants to take me to a private club where a few of her friends where waiting for her. I jumped in the shower and in 10 minutes I have transformed form a jet lagged chick to a international Tango Diva. We stroll the pristine streets of Stockholm, chatting about travel, life, and my plans for the next few weeks. In moments, we reach the club. It is a scene out of the La Dolce Vita – Scandinavian style. A few blocks later, we are in front of a stone building on a small plaza in front of the club that is bustling with VIPs. We walk in the door and magically are handed champagne! Liza introduces me to her first-class friends and I run into a guy that I met at the Monte Carlo Yacht Club last year. We talk, laugh, and share stories – all in English! 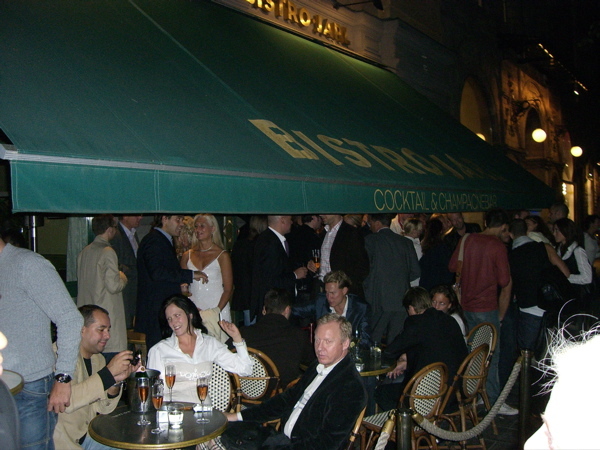 After the private club, we head to a few hot night stops and then we settle into Bistro Jarl, a cocktail and champagne bar. Liza ordered us a special cocktail made by the famous bartender Shassen Samaletdin. This delicious cocktail was kinda like an apple martini on ice, topped with champagne. It really was out of this world! But after my second one, I knew it was time to head back to my hotel, by way of a hot dog stand. I got to bed after 4:00 am, Stockholm time, and I knew that the next day was not going to start until after noon. Top up with Henriot Champagne and lightly stir. during the champagne wars of Stockholm.